Astronomy with an Opera-Glass: Redux. A trip down Memory Lane with a grand old book & opera glasses. Brief biographical outline: Garrett Putnam Serviss was born on March 24 1851 in Sharon Springs, New York, and educated at Johnstone Academy, New York. After finishing high school, Serviss entered the newly established Cornell University in 1868, graduating with a B.S. degree in Science with honours in 1872. During his time at Cornell, Garrett’s flare for the written and spoken word flourished, so much so that he won awards for poetry. After graduating, Serviss enrolled at Columbia College Law School and in June 1874, received his LL.B and shortly thereafter was admitted to the New York State bar. But practicing jurisprudence as a profession proved to have little appeal to the young man, so he tried his hand at journalism, accepting a job as a reporter and correspondent for the New York Tribune, which he pursued for two years. In 1876, he secured a job at The Sun ( not to be confused with the filth-filled modern newspaper bearing the same name! ), becoming copy editor of the paper after just a few years of service. It was during his time at The Sun that Serviss began writing popularised science articles and in particular, a string of articles on amateur astronomy. Indeed, he was so successful in his popuular science writings that his employers created a special role for Serviss as ‘Night Editor,’ a post he maintained for ten years, from 1882 through 1892. Like so many astronomy enthusiasts, Serviss’ interest in the celestial realm began in childhood on his parent’s’ rural farmstead, where his young eyes would have beheld the preternatural beauty of the night sky, arching from horizon to horizon. As his notoriety grew, Serviss was sought out by a growing fan base, who invited him to give public lectures in astronomy aimed at a lay audience. This allowed him to travel the length and breadth of the country and even on trips abroad to evangelise his love of the night sky. His great success as a science communicator led him naturally to a career as a professional writer, turning out a string of magazine articles and books; both fictional and non fictional, including A Trip to the Moon, Pleasures of the Telescope, and Astronomy in a Nutshell. Arguably his greatest and most far-reaching work in amateur astronomy was his Astronomy with an Opera Glass, which was first published in 1888, the subject matter of this blog. Among his other creations is a “Star and Planet Finder:” a forerunner to the modern planisphere, which he marketed in collaboration with a one Mr. Leon Barritt, which proved to be an indispensable science tool for school children throughout the United States. Serviss married Miss Eleanore Belts and together they had a son, Garrett P. Jnr., who excelled at athletics, winning the silver medal for his country in the High Jump at the 1904 Olympic Games in St. Louis. Sadly, Eleanore died in 1906, and just two days before Christmas 1907, his son also died whilst attending Cornell University. In later life, Serviss re-married a Madame Henriette Gros Gatier, who hailed from Cote d’Or, France, raisng her two children to adulthood. The recipient of many literary and scientific honours, Serviss was well travelled and comfortably well off for much of his long life. He died aged 78 years, survived by his second wife, stepdaughter and stepson. Overview of the Book: Astronomy with Opera Glasses: A popular Introduction to the Study of the Starry Heavens With the Simplest of Optical Instruments, was originally published in 1888 by D. Appleton & Company, London. This author will be making use of a high-quality modern re-print by Forgotten Books. The interested reader can also access an online version of the manuscript which can be perused here. The book consists of a short introduction, followed by five chapters covering the four seasons, as well as a chapter dedicated to the Moon and the planets. It is a short book in the scheme of things, with just 154 pages. Stargazing was never more popular than it is now. In every civilized country many excellent telescopes are owned and used, often to very good purpose, by persons who are not practical astronomers, but who wish to see for themselves the marvels of the sky, and who occasionally stumble upon something that is new even to professional star-gazers. Yet, notwithstanding this activity in the cultivation of astronomical studies, it is probably safe to assert that hardly one person in a hundred knows the chief stars by name, or can even recognize the principal constellations, much less distinguish the planets from the fixed stars.And of course of the intellectual pleasure that accompanies a knowledge of the stars. Author’s comments: To me, the written and spoken word of the English language reached its zenith at the end of the 19th century, during what we might call today the Late Victorian era. Back then, morals were clear, unambiguous and understood by all and sundry. Men were men and women could be women. Granted, life was considerably harder than it is today, but it was also more purposeful with it. People had a clear idea of what their roles were in an ordered and harmonious society; a society that cherished self sufficiency and honest work. Garrett Serviss, in his elegant writings from this long forgotten era in human history, provides us with a glimpse of what the glory of the heavens meant to a man of letters. But like so many men of his ilk, Serviss can trace his earliest days to humble beginnings on a rural farmstead run by his family. The stars were a comfort to those agrarian people, who still looked to them as signposts or timepieces, marking the passage of the seasons; auguring the time of sowing, reaping and threshing. And as Venus glowed in increasing splendor in the serene evenings of June, she continued to be mistaken for some petty artificial light, instead of the magnificent world that she was, sparkling ou there in the sunshine like a globe of burnished silver. Yet Venus as an evening star is not so rare a phenomenon that peple of intelligence should be surprised at it. To Serviss, the general ignorance concerning our nearest planetary neighbour provides an excellent backdrop for what he considers to be an even deeper ignorance of the stars, “the brother of our great father, the Sun.” Serviss links this perceived indifference to the stars to the largely mathematical nature of professional astronomy which tended to intimidate those without a penchant for precision and calculation. Luckily, though Serviss was undoubtedly acquainted with some advanced technical learning, the methods in this work entirely dispense of any need for such erudition. The heavens have a natural beauty that appeals to the human mind, whose heart has a deep longing for eternity, as King Solomon of old so eloquently expressed in the Book of Ecclesiastes (3:11). Perhaps one reason why the average educated man or woman knows so little of the starry heavens is because it is popularly supposed that only the most powerful telescopes and costly instruments of the observatory are capable of dealing with them. No greater mistake could be made. It does not require an instrument of any kind, nor much labor…..
Author’s note: How refrseshing it is to read such words, living as we are in a world driven by the ugly sceptre of materialism. This author became aware of this as he spun his own elaborate web of materialism, acquiring ever more costly telescopes in the somewhat pretentious and utterly mistaken view that one must ‘pay to play’. Thankfully, he liberated himself from that deadly entanglement and now enjoys good but modest instruments in his pursuit of heavenly treasures. Happy is he with his lot. And with the aid of an opera-glass most interesting, gratifying, and, in some instances, scientifically valuable observations may be made in the heavens. I have more than once heard persons who knew nothing about the stars, and probably cared less, utter exclamations of surprise and delight when persuaded to look at certain parts of the sky with a good glass, and thereafter manifest an interest in astronomy of which they would formerly have believed themselves incapable. It is at this juncture that Serviss begins to describe the simple optical accoutrement with which he weaves his inspiring allegory of the starry heavens; the opera-glass..
First a word about the instrument to be used. Galileo made his famous discoveries with what was, in principle of construction, simply an opera glass. The form of telescope was afterward abandoned because very high magnifying powers could not be employed with it, and the field of view was restricted. But, on account of its brilliant illumination of objects looked at, and its convenience of form, the opera glass is still a valuable and, in some respects, unrivalled instrument of observation. Author’s note: By the time Serviss penned these words, the Galilean telescope was long relegated to a mere historical curiosity, owing to the introduction of the achromatic doublet which offered far superior performance in terms of correction of chromatic aberration, coma and astigmatism, and allowing far higher magnifying powers to be employed. Binoculars had ‘evolved’ * considerably too , even in the case of the humble opera glass as he describes in the next few paragraphs of the introduction. *More a case of intelligent design than ‘blind evolution’ surely? In choosing an opera-glass, see first that the object-glasses are achromatic, although this caution is hardly necessary, for all modern opera-glasses, worthy of the name, are made with achromatic objectives. But there are great differences in the quality of the work. If a glass shows a colored fringe around a bright object, reject it. Let the diameter of the object-glasses, which are the lenses in the end furthest from the eye, be not less than an inch and a half. The magnifying power should be at least three or four diameters. Author’s note: A bona fide Galilean binocular would have consisted of a singlet convex objective and a singlet concave element as the eye lens. Yet, to a contemporary of Serviss, even at the extremely low powers delivered by such a device, chromatic aberration would be very objectionable and a very poor choice for the purposes of exploring the night sky. Serviss continues by demonstrating to the reader a simple way to estimate the magnifying power of his/her opera-glass, by focusing on a brick wall and estimating “how many bricks seen by the naked eye are required to equal in thickness one brick seen through the glass.” This is fairly easily achieved by holding the opera-glass up to one eye whilst leaving the other free to image the unmagnified view. With a few second’s practice, one will be able to simultaneously image both the magnified and naked eye image, allowing one to make a good estimate of how much magnifying power the instrument is delivering. The instrument used by the writer in making most of the observations for this book has object-glasses 1.6 inch in diameter , and magnifying power of about 3.6 times. See that the field of view given by the two barrels of the opera-glass coincide, or blend perfectly together. If one appears to partially overlap the other when looking at a distant object, the effect is very annoying. This fault arises from the barrels of the opera-glass being placed too far apart, so that their optical centers do not coincide with the centers of the observer’s eyes. Author’s note: For those who are interested in the development of the binocular through history, this resource was found to be quite authoratative. There is also an excellent youtube presentation of early binoculars available for viewing here and its follow-up here. Overview of the author’s instrument: While rummaging through an antique shop in the picturesque old English market town of Kendall, in the Lake District, Cumbria, the author’s wife spotted a curious leather case inside of which was found a dusty Galilean binocular. Prizing it out of the case, this author briefly tested it by focusing on a clock-face about fifty yards distant. The image was fairly dim, owing to the amount of dust on the lenses, but to his delight, the individual barrels were set just about at the optimal interpupillary distance to bring both eyes into a single, circular light cone. The focusing mechanism was found to be a bit stiff and clunky but still adequate for general use, and the lenses were pristine enough for him to take the decision to purchase the instrument and its brown leather case, all for the princely sum of £7. What follows here is a series of photographs of the instrument for the interested reader. The dusty object glasses on the binocular. The object glasses were measured to be 44mm in diameter, or 1.73 inches; which exceed Serviss’ minimum recommendations! The instrument has a neat pair of retractable lens shades. The instrument had a nice set of retractable lens shades. which could also double up as makeshift dew shields, which would ultimately come in handy during longer periods of field use. The instruments were apparently manufactured in France. Racking the eyepieces outward uncovers a “War Office” stanp on one of the barrels. When the eye lenses were racked outwards using the central focusing mechanism, the inscription “War Office” was found on the left barrell whilst the right barrel had ” Model” but no further information could be discerned. With this information, it became somewhat clear that these were World War I binoculars. Since France had a technological edge over Britain in the production of high-quality optical glass up to the beginning of the 20th century, it was reasonably assumed that there was a division of labour amongst these war-time allies, with the leather case being manufactured in England. Consulting an online forum dedicated to the Great War, confirmed the author’s suspicion of the division of labour adopted by Britain and France during World War I. Ascribing a date of manufacture corresponding to World War I was further substantiated by the uncoated lenses used in the instrument. Anti-reflection coating technology was still a few decades ahead when these binoculars were being made. The instrument is constructed mostly of metal parts but the lens shades and the central focusing wheel look as though they were made of the earliest commercial synthetic polymer, Bakelite, which was used extensively after 1909. Source here. The innards of the Galilean binocular with a simple cylindrical light baffle placed immediately ahead of the eye lens. Before and after cleaning the object glasses. After carefully cleaning the lenses and putting it all back together again, and tightening up the screw which adjusts the tension on the focusing wheel, the author was delighted by how much esier it was to use, with brighter and more crisp images to boot. The instrument was now ready for field use. Preliminary testing of the instrument allowed this author to estimate its magnifying power at about 3.5x, just about the same as Serviss’ original instrument. Further tests on the night sky allowed him to estimate the field of view offered up by the instrument. Turning to the handle of the Ploughshare showed that the field glass was able to just about fit the stars Mizar and Alioth in the same field. Yet another test showed that the instrument was able to fit most of the main ‘V’ of the Hyades star cluster in Taurus, allowing him to estimate its field of view to be ~ 4.5 +/- 0.1 angular degrees; considerably less than a modern binocular but adequate enough to pursue this project. There is no facility to adjust the interpupillary distance on this instrument or to adjust one ocular independently of the other, but this was not found to be an issue. Clearly, this was a no-frills instrument designed for basic use. There is no lavish overlaying of mother-of-pearl or some other ornate covering on this instrument like so many other beautiful Galilean binoculars dating from the late 19th century and early 20th century, but this is entirely in keeping with its intended use. And while it would be easy to get carried away, as it were, and imagine that the instrument was actually used on the battle front, this author was content with entertaining the idea that it might have only seen use by ordinary civilians. The author was over the Moon with his purchase. This was a genuine example of an instrument described by Serviss, allowing this author to authenticate the literary descriptions proferred in the work. This is an important issue going forward; to really experience the visual sensations of a Victorian amateur, one ideally has to use an instrument from the same period, or as near as can be. There is little point in claiming that one has the heart of a Victorian observer without also using instruments that would have been right at home in the same period. Doing it any other way is little more than cheating lol! Now we are ready to enjoy the night sky as Serviss may have viewed it through his simple opera-glasses. Since each chapter of the book can be enjoyed independently of the others, for convenience, this author will commence with an exploration of the autumnal (fall) night sky (Chapter III) since this is the season in which this blog was first initiated. It is certainly true that a contemplation of the unthinkable vastness of the universe, in the midst of which we dwell upon a speck illuminated by a spark, is calculated to make all terrestrial affairs appear contemptibly insignificant. We can not wonder that men for ages regarded the earth as the center, and the heavens with their lights as tributary to it, for to have thought otherwise, in those times, would have been to see things from the point of view of a superior intelligence. It has taken a vast amount of experience and knowledge to convince men of the parvitude of themselves and their belongings. So, in all ages, they have applied a terrestrial measure to the universe, and imagined they could behold human affairs reflected in the heavens and human interests setting the gods together by the ears. This is clearly shown in the story of the constellations. Garrett Serviss, writing as he was at the end of the 19th century, held fairly typical ideas for his time regarding the plurality of worlds. He, like so many of his contemporaries, believed the vastness of the starry heaven pointed to humanity’s mediocrity (‘parvitude’) in the scheme of things. Although he does not explicitly express it, he probably believed life was commonplace in the Universe. Back then, scientists were totally ignorant of the sheer complexity of even the simplest living cell- equivalent to that observed in the largest of human cities – and so was not in a position to see the incredible unlikelihood of something as complex as a living thing coming into being without the mediation of an intelligent agency. Today, the consensus appears to be shifting considerably from this scientifically naive view of the ubiquity of life on other worlds, especially now since a great deal more scientific evidence has come to the fore strongly suggesting that life on Earth did not evolve in any Darwinian sense. As this author has explained elsewhere, Serviss’ view of humanity as “contemptibly insignificant” is demonstrably false. We are, almost certainly, the only sentient creatures ever to have been created aside from the angels (the host of heaven). The tremendous truth that on a starry night we look, in every direction, into an almost endless vista of suns beyond suns and system upon systems, was too overwhelming for comprehension by the inventors of the constellations. So they assumed themselves, like imaginative children, as they were, by tracing the outlines of men and beasts formed by those pretty lights , the stars. They turned the starry heavens into a scroll filled with pictured stories of mythology. Four of the constellations with which we are going to deal in this chapter are particualrly interesting on this account. ….The four constellations to which I refer bear the names of Andromeda, Perseus, Cassiopeia and Cepheus, and are sometimes called, collectively, the Royal Family. Author’s note: The constellations that Serviss has chosen to discuss at length are prominent in the skies of early autumn and are especially well placed at the latitude this author observes from:- 56 degrees north. Indeed, they are better placed in his skies than they were for Serviss, who presumably would have observed from mid-northern latitudes and afford a wealth of objects that can be studied with the opera-glass. The stars Alpha, called Giedi, and Beta, called Dabih, will be recognized, and a keen eye will perceive that Alpha really consists of two stars. They are about six minutes of arc apart, and are of the third and the fourth magnitude, respectively.These stars, which to the naked eye appear almost blended into one, really have no physical connection to each other, and are slowly drifting apart. The star Beta, or dabih, is also a double star. The companion is of a beautiful blue colour, generally described as “sky blue.” Is is of the seventh magnitude , while the larger is of magnitude three and a half. The latter is golden yellow. The blue of the small star can be seen with either an opera- or field glass. In the same field about 2.5 degrees further south, you will be able to make out the golden tint of third magnitude Dabih (Beta Capricorni). In modern 10 x 50s, it too is revealed to be a double star, the companion being of the sixth magnitude of glory. Alas, the low power of the opera-glass, as well as the large brightness differential between the two, not to mention its low elevation above the horizon, makes this very difficult, if well nigh impossible to discern. What can you make out? A suggestion by Sir John Herschel, concerning one of these faint companions, that it shines by reflected light, adds to the interest, for if the suggestion is well founded the little star must, of course, be actually a planet, and granting that, then some of the other faint points of light seen there are probably planets too. It must be said that the probabilities are against Herschel’s suggestion. The faint stars more likely shine by their own light. This just goes to show that even great astronomers can be dead wrong! Having said that, it is possible to see Earth-sized objects at stellar distances. Take the famous ‘pup,’ the faint companion to the Dog Star, Sirius B, for example, which can be seen in a 3-inch telescope in the current epoch. The companion, a white dwarf star, is incredibly small and dense but highly luminous! With the most powerful glass at your disposal, sweep from the star Zeta eastward a distance somewhat greater than that separating Alpha and Beta, and you will find a fifth-magnitude star beside a little nebulous spot. This is the cluster known as 30 M, one of those sun-swarms that overhwelm the mind of the contemplative observer with astonishment, and especially remarkable in this case for the apparent vacancy of the heavens immediately surrounding the cluster…. Author’s note: Throughout much of the 19th- and early 20th centuries, the Messier objects were denoted by a number followed by the capital letter, ‘M,’ in contrast to today, where the letter ‘M’ precedes the number. M30 (a bright, 7th magnitude globular cluster located some 26,000 light years away) can indeed be picked up as a distinctly non-stellar blob in an opera-glass but its full glory can only be appreciated with a modest sized telescope and high magnifications. The fifth magnitude star Serviss is likely referring to is 41 Capricorni. Serviss then moves from Capricorn to Aquarius, situated to the northeast of the latter and more accessible to observers located at high northerly latitudes. Serviss launches into an interesting discussion of the mythology related to the celestial Water-Bearer, both in ancient cultures and in more recent Arabic lore. The star Tau is double and presents a beautiful contrast of color, one star being white and the other reddish orange- two solar systems, it may be, apparently neighbors as seen from the earth, in one of which daylight is white and in the other red! Tau Aquarii is indeed a beautiful and easy sight to behold in the opera-glass, with both stars being separated by about 0.65 angular degrees. Serviss’ fecund imagination goes to work here as he rightly considers the colour these stars cast on the landscape of hypothetical planets that might exist there. Serviss then discusses the fascinating 8th magnitude object in Aquarius that we know today as the Saturn Nebula (NGC 7009), an appellation first bestowed upon it by the Third Earl of Rosse (Birr, Ireland). Point a good glass upon the star marked Nu, and you will see, somewhat less than a degree and a half to the west of it, what appears to be a faint star of between the seventh and eighth magnitudes. You will have to look sharp to see it. It is with your mind’s eye that you must gaze, in order to perceive the wonder here hidden in the depths of space. The faint speck is the nebula, unrivalled for interest by many of the larger and more conspicuous objects of that kind. Lord Rosse’s great telescope has shown that in form it resembles the planet Saturn; in other words, that it consists apparently of a ball surrounded by a ring……..If Laplace’s nebular hypothesis, or any of the modifications, represents the process of formation of a solar system, then we may fairly conclude that such a process is now actually in operation in this nebula in Aquarius, where a vast ring of nebulous matter appears to have separated off from the spherical mass within it. Author’s note: The visualisation of the Saturn Nebula with the opera glass is certainly possible but it only presents as a very faint 8th magnitude ‘field star’. Serviss, writing at the time when modern astrophysics was in its infancy, had no idea that what he was describing was not, in fact, a solar system in formation, but one rather that was in the process of dying. The Saturn Nebula is a prominent planetary nebula, a geriatric star in its final death throes, as it sheds its outer atmosphere to the great, cold dark of interstellar space. On page 69, Serviss invites us to examine the star Delta Aquarii with the opera glass. At magnitude + 3.3, it shines with a blue-white hue. It is here, so Serviss informs us, that Tobias Mayer ” narrowly escaped making a discovery that would have anticipated that which a quarter century later made the name of Sir William Herschel world-renowned.” In 1756, the planet Uranus passed very close to this star but it moved so slowly that it escaped his notice. Author’s note: The story of Uranus is really the story of ‘near misses.’ The historical archives reveal many such ‘nearly never made it’ sightings of the 7th planet orbiting the Sun. In fact, Galileo himself almost certainly sighted Uranus in the early 17th century, but did not realise its significance. Author’s note: The Great Square of Pegasus is all the more remarkable for its great paucity of bright stars. Indeed, this is precisely the reason why it stands out so prominently in autumn skies. How many stars can you make out within the body of the square? From my reasonably dark site I can make out about, this author can make out maybe a half dozen stars ranging in magnitide from +4 to +5.5, most prominent of which are Upsilon, Tau, Psi and Phi, which vary in glory from +4.4 to +5.1. Additionally, when the constellation is higher up in the sky, and with good transparency and no Moon, additional members can be made out with some concentration; 71 Pegasi ( magniude +5.4) can be glimpsed near the centre of the square and 75 Pegasi (+5.5) just a few degrees further south. 85 Pegasi might also be glimpsed just above Algenib (Gamma Andromedae) near the border with Pisces. Many more are possible from the darkest skies, however. Indeed, counting the number of stars within the Great Square that are visible to the naked eye remains a good test of how dark and transparent your skies are. However, even a thin veneer of haze will all but extinguish the fainter stars visible to the naked eye on the best nights. Although Pegasus presents a striking appearance to the unassisted eye on account of its great square, it contains little to attract the observer with an opera-glass. It will prove interesting to sweep with the glass carefully over the space within the square , which is comparitively barren to the naked eye but in which many small stars will be revealed, of whose exstence the naked-eye observer would be unaware. The star marked Pi is an interesting double, which can be separated by a good eye without artificial aid, and which, with an opera-glass, presents a fine appearance. Sweeping with the opera-glass within the confines of the Great Square is still a worthwhile endeavour, where many fainter stars of magnitude 7 and 8 come into view. Though Serviss does mention it, the opera-glass is just the perfect optical accoutrement to properly discern the colour differences between the stars marking the vertices of the Great Square. To this author’s eye, only first magnitude stars clearly reveal their colours, but with the opera-glass you’ll be able to make out that Markab (Alpha Pegasi) and Algenib (Gamma) are lovely blue-white in hue, whilst Scheat (Beta) has, in comparison, a soft ruddy colour. Another beautiful target is Enif (Epsilon), located in the south-western edge of the Flying Horse, near the border with the diminutive constellations of Delphinus and Equuleus. Owing to its rather irregular variability, it can sometimes manifest as the brightest star in Pegasus, outshining all the others in glory, with its fetching orange complexion. Though a little beyond the low powers offered by the opera-glass, a larger field glass should also reveal Enif’s wide and faint (magnitude 8.6) companion. It is somewhat surprising that Serviss fails to mention M 15, a bright, sixth magnitude globular cluster just off to the northwest of Enif. Appearing as a fuzzy star in the opera-glass, averted vision should allow you to see it swell to nearly twice the size it appears using direct vision. Finally, another target worth seeking out is the fifth magnitude star, 51 Pegasi, a sun-like (G class) star located roughly midway between Alpha and Beta Pegasi. Situated just 50 light years from the solar system, 51 Pegasi was shown to have a planet about half the mass of Jupiter circling its parent star just a few million miles from its fiery surface. Fascinated as he was in the ‘plurality of worlds,’ were he alive today, Serviss would most certainly have waxed lyrical about this star system! By far the most interesting object in Cetus is the star Mira. This is a famous variable- a sun that sometimes shines a thousand-fold more brilliantly than at others! It changes from the second magnitude to the ninth or tenth, its period from maximum to minimum being about eleven months. During about five months of that time it is completely invisible to the naked eye; then it begins to appear again, slowly increasing in brightness for some three months, until it sjines as a star of the second magnitude, being then as bright as, if not brighter than, the most brilliant stars in the constellation. It retains this brilliance for about two weeks, and then begins to fade again, and, within three months, once more disappears. Author’s note: Mira is a wonderful subject for the opera glass. It was discovered to be variable by the Dutch astronomer, David Fabricius in 1596, barely a decade before the telescope first made its mark on European civilization. At its brightest, it is a handsome ruddy colour in the opera glass and, thanks to a number of suitable ‘reference stars’ of fixed brightness in its vicinity, which vary in glory from the 6th to the 8th magnitudes, they can be used to monitor its changing luminosity over the weeks and months.It’s period is 332 days. Knowing that our Sun is a variable star-though variable only to a slight degree, its variability being due to the spots that appear upon its surface in a period of about eleven years- we possess some light that may be cast upon the mystery of Mira’s variations. It seems not improbable that, in the case of Mira, the surface of the star at the maximum of spottedness is covered to an enormously greater extent than occurs during our own sun-spot maxima, so that the light of the star, instead of being merelty dimmed to an almost imperceptibe extent , as with our sun, is almost blotted out. Author’s note: Serviss was wrong in his explanation of Mira’s extraordinary variability. Its variability is actually caused by its sinusoidal expansion and contraction, from 400 to 500 times the diameter of our own Sun. It is this change in radius and temperature that gives rise to its variability. Mira is at the latest stage of its evolutionary journey and, as a result, is shedding its outer atmosphere to interstellar space. We might even go so far as to say that possibly Mira presents to us an example of what our sun will be in the course of time, as the dead an barren moon shows us, as in a magician’s glass, the approaching fate of the earth. Fortunately, human life is a mere span in comparison with the aeons of cosmic existence, and so we need have no fear that either we or our descendants for thousands of generations shall have to play the tragic role of Cambell’s ” Last Man,” an endeavor to keep up a stout heart amid the crash of time by meanly boasting to the perishing sun, whose rays have nurtured us, that, though his proud race has ended, we have confident anticipations of immortality. I trust that when man makes his exit from this terrestrial stage, it will not be in the contemptible act of kicking a fallen benefactor. For here we do not have a lasting city, but we are seeking the city that is to come. You will find it very interesting to take your glass and , beginning with the attractive little group in the Northern Fish, follow the windings of the ribbon, with its wealth of tiny stars, to the Western Fish. When you have arrived at that point, sweep well over the sky in that neighborhood, and particularly around and under the stars Iota, Theta, Lambda and Kappa. If you are using a powerful glass, you will be surprised and delighted by what you see. Author’s note: The most distinctive feature of this constellaton is the attractive loop of seven stars situated at its southwestern edge known as the Circlet. The field of view offered up by the opera glass used by this author is not large enough to encompass them all, but a modern, wide-angle binocular can certainly do so. Centre Kappa and Lambda Piscium in the field. Just a short distance south of these stars lies the spot where the Sun crosses the celestial equator, heralding the arrival of Spring in the northern hemisphere. While you’re there, it’s worth checking out a pretty little asterism known as Alessi J23407+0757 situated just over two degrees north of Iota Piscium. Appearing quite smudgy in the opera glass owing to its small image scale, it makes a delightful telescopic sight consisting of about half a dozen stars. Gamma Arietis, is interesting as it was the first telescopic double star ever discovered. Its duplicity was detected by Dr. Hooke while watching the passage of a comet near the star in 1664. Author’s note: The opera glass will pick up a faint star ( 7 Arietis) just west of Mesarthim, but this is not the duplicity Serviss speaks of. In a small telescope using low power, magnitude 3.9 Mesarthim is seen to be composed of two stars, both white and of nearly equal magnitude; 4.6 and 4.7. The starry riches of these constellations are well matched with their high mythological repute. Lying in and near the Milky-Way, they are particularly interesting to the observer with an opera glass. Besides, they include several of the most celebrated wonders of the firmament. In searching for picturesque objects in Andromeda, begin with Alpheratz and the groups forming the hands. Below the girdle will be seen a rather remarkable arrangement of small stars in the mounth of the Northern Fish. Now follow up the line of the girdle to the star Nu. If your glass has a pretty wide field, your eye will immediately catch the glimmer of the Great Nebula in Andromeda in the same field with the star. Author’s note: The “Great Nebula” in Andromeda is indeed a fine sight in the author’s opera glass, where its central bulge and extended spiral arms look rather like two fried eggs set back to back. By turning the eyes aside, the nebula can be seen, extended as a faint, whispy light, much elongated on either side of the brighter nucleus. Author’s note: We have a tendency today to think that many of the more advanced skills employed by visual observers are essentially modern developments. And yet Serviss clearly reveals to us that the eminently useful activity of using averted vision (using the night-sensitive rod cells situated either side of the fovea) was known and used to good effect at the end of the 19th century. On page 80 through 81, Serviss described the curious phenomenon of a nova seen superimposed on the Andromeda Nebula in 1885, which flared up suddenly and faded back to invisibility in the course of just a few months. He does not however, reveal the interesting story of its discovery. Author’s note: What Serviss is almost certainly referring to is SN 1885, which was first chanced upon by the French astronomer; Ludovic Gully, on the evening of August 17 1885 from Rouen, France, during a public stargazing event. Intriguingly, Gully dismissed the event as an artifact of ineffective baffling of his telescope from scattered moonlight and so did not follow it up and report it to the broader astronomical community. Just two evenings later, it was apparently seen by the Irish amateur astronomer, Isaac Ward(1834-1916), based in Belfast, who described its appearance as ruddy and with an estimated magntude brightness of + 7. The Northern Irish astronomer, Isaac Ward (1834-1916), seen here sat beside the 11cm achromatic refractor he allegedly used to observe SN 1885A. Image credit: Wiki Commons. SN 1885A was picked up by Ernst Hartwig, based at Dorpat (Tartu) Observatory, Estonia, on the evening of August 20 1885, when its existence was finally communicated to the international community. Despite attempts by both Gully and Ward to claim it as their own, the discovery of ‘S Andromedae’ (the common name soon bestowed upon it), was credited to Hartwig. SN 1885A was a supernova, which reached its maximum brightness of +5.85 on August 21 1885 after which it faded back to magnitude 14 a year later. More historical information regarding the object can be viewed here. SN 1885A retains the distinction of being the only supernova event to have been viewed in the Andromeda Galaxy to this day. Although it appeared to be beside the bright nucleus of the nebula, it is likely that it was really hundreds or thousands of millions of miles either this side or the other side of it. On page 81, Serviss encourages users of the opera glass to conduct sweeps through Andromeda eastwards towards Cassiopeia and Perseus. As we do so, the richness of star fields increases dramatically as our portal on the heavens rejoins the meandering river of stars that is the Miky Way. On page 82, Serviss pauses to consider Gamma Andromedae, which presents in a comely golden hue in the opera glass. He also points out that this is the spot in the sky that demarks the radiant of the Biela (Andromedid) meteor shower, so called after the astronomer who first discovered a short period comet that graced the inner solar during the mid 19th century. Author’s note: Serviss was also a keen telescopist and indeed published a splendid book (mentioned earlier in passing) dedicated to the sights within reach of a small telescope. What’s more, this author imagines him using both the opera glass and the telescope profitably to bring the many treasures of the northern sky within reach of his eyes. Serviss alerts us to the beautiful colour contrast triple system, Gamma Andromedae (pp 82), which is a delightful sight in a telescope employing moderate powers. Before leaving Andromeda, be sure to check out the terrific binocular triple, Nu Andromedae. Observers with the keenest eyesight should try their hand at seeing this triple system with the naked eye. Next let us turn to Perseus. The bending row of stars marking the center of this constellation is very striking and brilliant. The brightest star in the constellation is Alpha, or Algenib, in the center of the row. The head of Perseus is toward Cassiopeia, and in his left hand he grasps the head of Medusa, which hangs down in such a way that its principal star, or Algol, forms a right angle with Algenib and Almach in Andromeda. Turn now to the bright star Algenib, or Alpha Persei. You will find with the glass an exceedingly attractive spectacle there. In my note-book I find this entry, made while sweeping over Perseus for materials for this chapter: “The field about Alpha is one of the finest in the sky for an opera glass. Stars conspicuously ranged in curving lines and streams. A host follows Alpha from the east and south.” The picture on page 84 will give the reader some notion of the exceeding beauty of this field of stars, and of the singular manner in which they are grouped, as it were, behind their leader. A field glass increases the beauty of the scene. Author’s note: The reader will note that Serviss refers to Alpha Persei as ‘Algenib’ rather than the more familiar name of ‘Mirfak’ used by astronomers today. Serviss took notes while observing; an essential activity for any serious observer! In October, Perseus rides very high in the sky at the author’s location, making it especially well placed for observation. The stream of stars around Mirfak referred to by Servis is known today as the Alpha Persei moving cluster (or association). Centring the opera glass on Mirfak reveals about a dozen stars of magnitue 6 or greater within a two degree radius anda few more ‘outliers’ can be picked up by virtue of the glass’ larger field of view (~4.5 degrees). This remarkable clustering of star light presents one of the most spectacular sights in all the northern heavens using a field glass. Indeed, so large and sprawling is this cluster that it is somewhat lost in the field of view offered up by even the smallest rich field ‘scope! Modern binoculars have come an awful long way since Serviss penned his words. Today, one can obtain very decent binoculars for a modest price offering much higher contrast, magnification and field of view than anything Serviss could have dreamed of! The author’s 8 x 42 binocular, for example, samples a field fully 7.3 degrees wide, and with a higher magnification can pull out considerably fainter members than any early 20th century field glass. This instrument makes observing through the old field glass more like looking through a straw than anything else! This author considers it a great blessing that he is able to use such a wonderful optical instrument from the 21st century! Intelligent development: a modern binocular (right) exceeds the power of old opera glasses by a huge margin. Observing the Alpha Persei Association with a modern binocular cannot fail to introduce a deep sense of awe concerning the vast beauty of the heavens! The reader will find a starry cluster marked on Map 17 as the “Great Cluster.” This object can be easily detected by the naked eye, resembling a whisp of luminous cloud. It marks the hand in which Perseus clasps his diamond sword, and, with the aid of a telescope of medium power, it is one of the most marvelously beautiful objects in the sky- a double swarm of stars, bright enough to be clearly distinguished from one another, and yet so numerous as to dazzle the eye with their lively beams. Author’s note: The view of the Double Cluster is considerably improved with an opera glass, but it is much better seen with decent aperture telescopes. This author observes it pretty much routinely for much of the year and finds that the view becomes better and better the larger the telescope is employed. There will be a natural limit though, as the largest telescopes will have a field of view that becomes too small to sample the full glory of this celebrated deep sky object. The best view he has had in recent years is through a 12″ f/5 Newtonian reflector using a 34mm wide angle eyepiece serving up a power of 45x in a 1.5 degree true field, but a very close second is at 59x in the same telescope in a one degree field.The latter is slightly less favoured, as it restricts some of the hinterland to these clusters from being comfortably observed. Nearby, about mid-way between Algol and the lovely golden Gamma Andromedae (Almach), the opera glass makes light work of picking up the open cluster also mentioned by Serviss as’ 34 M’. When high in the sky, during October and November, one can make out perhaps a half dozen of its brightest stellar members and perhaps twice that with a 10 x 50 binocular. Telescopically, M 34 is reasonably rewarding, presenting a rich scattering of white, yellow and orange stars at moderate medium powers. Here the Milky-Way is so rich that the observer hardly needs any guidance, he is sure to stumble upon interesting sights for himself. The brightest stars are generally represented as indicating the outlines of the chair or throne in which the queen sits, the star Zeta being in her head. Look at Zeta with a good, field glass, and you will see a singular and brilliant array of stars near it in a broken half circle, which may suggest the notion of a crown. This shows the spot where the famous temporary star, which has of late been frequently referred to as the “Star Of Bethlehem,” appeared. It was seen in 1572 , and carefully observed by the famous astronomer Tycho Brahe. It seems to have suddenly burst forth with a brilliance that outshone every other star in the heavens, not excepting Sirius itself. But its supremacy was short-lived. In a few months it had sunk to the second magnitude. It continued to grow fainter, exhibiting some remarkable changes of color in the meantime, and in less than a year and half it disappeared. In short, there are two many suppositions and assumptions involved to allow any credence being given to the theory of the periodicity of Tycho’s wonderful star. At the same time, nobody can say it is impossible that the star should appear again, and so it may be interesting to the reader to know where to look for it. Author’s note: Serviss is justified in expressing caution in attributing the Star of Bethlehem to Tycho’s Star. As a Bible believing Christian, the ‘Star’ was undoubtedly a real phenomenon, as were Christ’s teachings, miracles, death and resurrection. Best to leave it at that! No harm done in visiting this spot in Cepheus from time to time! With a good eye, a steady hand and a clear glass, magnifying not less than six diameters, you can separate them, and catch the contrasted tints of their light. Author’s note: The separation of Delta Cephei A & B has hardly changed since Serviss penned his words. Today they are separated by 41,” precisely the number proffered by Serviss at the end of the 19th century (see page 88). Try as he may, this author has not been able to prize the components apart using his low power opera glass. Even his steadily-held 8 x 42 failed the test. He has however found it no trouble to separate the components using a power of about 15x in a 80mm shorttube achromatic telescope on a steady night with good transparency. But one can easily monitor the changing brightness of the Cepheid variable (Delta Cephei A) with an opera glass, which gradually fades from magnitude 3.5 back to 4.4 over a period of about five days and 9 hours. Covering pages 89 through 117. I have never beheld the first indications of the rising of Orion without a peculiar feeling of awakened expectation, like that of one who sees the curtain rise upon a drama of absorbing interest. 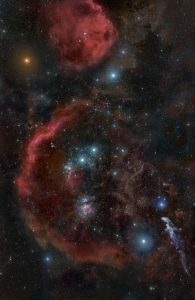 And certainly the magnificent company of the winter constellations, of which Orion is the chief, make their entrance upon the scene in a manner that may be described as almsot dramatic. First in the east come the world-renowned Pleiades. About the same time Capella, one of the most beautiful of stars, is seen flashing above the north-eastern horizon. These are the sparkiling ushers to the coming spectacle. In an hour the fiery gleam of Aldebaran appears at the edge of the dome below the Pleiades, a star noticeable among a thousand for its color alone, besides being one of the brightest of the heavenly host. The observer familiar with the constellations knows, when he sees this red star which marks the eye of the angry bull, Taurus, that just behind the horizon stands Orion with starry shield and upraised club to meet the charge of his gigantic enemy. With Aldebaran rises the beautiful V-shaped group of the Hyades. Despite being separated by over a century of time, Serviss’ opening lines in this chapter covering the winter sky, immediately resonate with this author, as though he were standing right beside him on a clear and dark winter evening. Orion is indeed the great herald of the hyemal heavens, its august form dominating the meridian from well after midnight in early December but arriving increasingly earlier as the winter progresses. As well as hosting a riot of bright stars crying out for observation with an opera glass, Orion’s brilliant luminaries – Rigel and Betelgeuse – are accompanied by a host of brilliant suns that decorate the heavens: Sirius and Procyon dominate the sky low in the southeast, and higher up, fiery red Aldebaran in Taurus, and creamy yellow Capella, the jewel of Auriga. The heavenly twins, Castor & Pollux boldly announce the arrival of Gemini, and over in the west at sunset, the white and blue-white luminaries of summer still make their presence felt; Altair in Aqulia, Deneb in Cygnus and Vega corruscating wildly in the denser air at lower altitude. This rich assortment of bright stars create the unmistakable impression that the winter sky is darker than at other times of the year. And, indeed, there is more than a grain of truth to this assertion; for it is at this time of year that our gaze begins to carry us away from the extremely bright centre of our galaxy, and faces the Perseus spiral arm of our Milky Way. The heavens contain no other naked-eye view comparable with this great array, not even the glorious celestial region where the Southern Cross shines supreme, being equal to it in splendor. To comprehend the real glories of the celestial sphere in the depth of winter, one should spend a few clear nights in the rural districts of New York and new England. Author’s note: Clearly, by the 1890s, light pollution was becoming a signifiant issue for urban dwellers in comparison to the darker skies of earlier times. The reader is referred to maps 18 and 19 feaured on pages 92 and 93 of the text. Serviss begins with the large and winding constellation Eridanus the celestial River, so named by the ancient Greeks, though the Egyptians intended that it should really represent the majestic Nile. Only the northernmost stars are visible from the author’s far northerly latitude, where the opera glass sweeps up a good assortment of its stars including Beta, which forms part of the ‘foot’ or Orion near Rigel, but also the roughly linear array of stars comprising Gamma, Pi, Epsilon and Delta Eridani. Fluvius (Latin for ‘river’) Eridanus, as it is affectionately known to this author, snakes its way over a prodigious 100 degrees of sky, as far south as the bright blue-white star, Achernar, some 57 degrees and 42 minutes south of the celestial equator and so hopeless beyond the ken of observers situated in the far north. There are the two Omicrons, the upper one being o1 and the lower one o2. The latter is of an orange hue, and is remarkable for the speed which which it is flying through space. There are only one or two stars whose proper motion, as it is called, is more rapid than that of o2 in Eridanus. It changes its place nearly seven minutes of arc in a century. Author’s note: The large proper motion of o2 Eridani is a sure sign that it is located relatively near the solar system. Indeed astronomers esimate that is a mere 16 light years away. Though both o1 and o2 Eridani are quite easily seen with the opera glass, the deeper secrets of the orange star o2 are quite beyond its powers. o2 actually has two faint companions of magnitudes 9.5 and 10.5, which were both uncovered by Sir William Herschel, observing from Bath, England, onthe evening of January 31 1783. These can be resolved by a small telescope using moderate magnifications (discussed by Serviss on page 95). the brighter magnitude 9.5 star is actually a white dwarf, discovered to be such in 1910, while the fainter 11th magnitude component is now known to be a red dwarf star that orbits the white dwarf every 250 years or so. What an eclectic communion of suns! Many of these stars can be seen, on a dark night, with an ordinary opera glass, but, to see them well, one should use as large a field glass as he can obtain……Below the tips of the horns and over Orion’s head, there are also rich clusters of stars, as if the Bull were flaunting shreds of sparkling raiment torn from some celestial victim of his fury. With an ordinary glass, however, the observer will not find this star-sprinkled region around the horns of Taurus as brilliant a spectacle as that presented by the Hydaes and the group of stars just above them in the Bull’s ear. 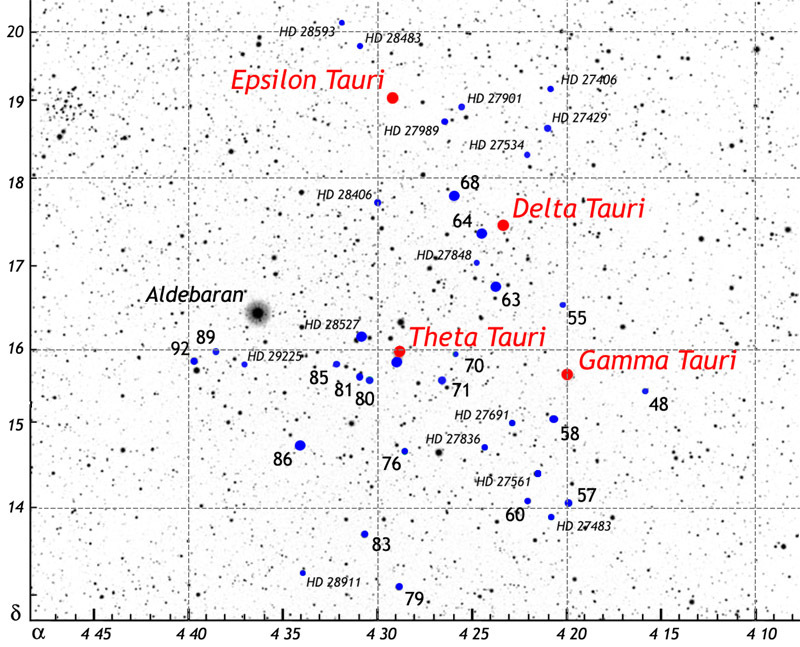 Map of the main stars of the Hyades asterism in Taurus. The horizontal axis is measured in hours and minutes of right ascension, and the vertical axis is measured in degrees of declination. Image credit: Wiki Commons. This author has enjoyed many evenings observing the Hyades with his opera glass, or with modern binoculars. The rather restricted field (4.5 angular degrees) of view of the former will just accommodate the main part of the Hyades asterism, but it is still enough to soak up the beautiful ruddy tint of brilliant Aldebaran, and will show many of the brighter stars in the southern part of the characteristic ‘V’ shape, where the mind’s eye can indeed conceive of them as ” shreds of sparkling raiment,” as Serviss describes them. Indeed, close inspection with the opera glass reveals subtle colour differences between its constituent stars; orange, yellow and white. His remarks concerning what can be seen in a larger ‘field glass’ are entirely valid however. For example, in a modern compact binocular, such as the author’s 8 x 42, the view of the Hyades is transformed immeasurably from that seen in the early 20th century opera glass, where many more stars are manifested owing to considerably greater magnification and a much wider field of view. In particular, the southern part of the asterism comes alive with dozens of faint stars like sparks falling from the fiery red coals of Aldebaran. Indeed, the view of the Hyades in a modern binocular offering a 7 or 8 degree true field is arguably one of the most fetching sights in all the heavens and one this author never tires of exploring! On page 97, Serviss states that the Crab Nebula ( Messier 1) can be seen in a ” first rate field glass,” in the vicinity of Zeta Tauri. Author’s note: Alas, I have been unable to detect M1 from my observing site using the opera glasses. Indeed, it is very challenging in the 8 x 42, but readily seen as a tiny nebulous speck in a 10 x 50 at the same site. The author did however detect the Crab from a darker setting in the southwest of Scotland using his 8 x 42 during a family vacation in October 2018. The fact that it is a difficult binocular object today probably reflects the darker conditions enjoyed by Serviss at the end of the 19th century. The redness of the light of Aldebaran is a very interesting phenomenon. Careful observation detects a decided difference between its color and that of Betelgeuse, or Alpha Orionis, which is also a red star……Aldebaran has a trace of rose-color in its light, while Betelgeuse is of a very deep orange. Author’s note: This is indeed the case. As stated previously, the opera glass is a capital instrument to discern colours in stars. This author can readily detect a rose tinting in Aldebaran while the hue of Betelgeuse does indeed present as a very deep orange. This probably reflects the spectral differences between the stars (K5 and M1 respectively), which in turn are attributed to different absorption characteristsics of the gaseous matter in their outer atmosphere. In every age and in every country the Pleiades have been watched, admired and wondered at, for they are visible from every inhabited land of the globe. To many, they are popularly known as the Seven Sisters , although few persons can see more than six stars in the group with the unaided eye. It is a singular fact that many of the ancient writers declare that only six Pleiades can be seen, although they will also assert that they are seven in number. these seven were the fabled duaghters of Atlas, or the Atlantides, whose names were, Merope, Alcyone, Celaeno, Electra, Taygeta, Asterope and Maia. They have impressed their mark, in one way or another, upon the habits, customs, traditions, language, and history of probably every nation. This is true of savage tribes as well as great empires.The Pleiades furnish one of the principal links that appear to connect the beginnings of human history with that wonderful prehistoric past, where, as through a gulf of mist, we seem to percieve faintly the glow of a golden age beyond. Author’s note: The Genesis creation account states that when God first fashioned humans in His image from the dust of the ground, he became a living, breathing soul endowed with remarkable cognitive abilities(far in excess of any beast which, in itself, still presents an intractable problem for evolutionists). And sure enough, archaeologists have uncovered many cave paintings which affirm mankind’s long fascination with the stars, where the Pleiads are often depicted in highly accurate astronomical renderings. See this article for interest. Clearly these early people were no dummies! With the most powerful field-glass you may be able to see all the stars represented in our picture of the Pleiades. With an ordinary opera-glass the fainter ones will not be visisble; yet even with such a glass the scene is a remarkable one. Not only all of the “Seven Sisters” but many other stars can be seen twinkling among them. Author’s note: The low-power opera glass does indeed show many more stars (perhaps 15?) than can be seen with the unaided eye but is simply not powerful enough to discern the fainter members drawn on his diagram presented on page 103. Nonetheless, the opera glass still presents a beautiful and engaging image of this celebrated star cluster that is substantially eclipsed by modern binoculars with their higher powers and superior light throughput. Still another curious fact about the Pleiades is the existence of some rather mysterious nebulous masses in the cluster. In 1859 Temple discovered an extensive nebula, of a broad oval form, with the star Merope immersed in one end of it. Subsequent observations showed that this strange phenomenon was variable. Sometimes it could not be seen; at other times it was very plain and large. In Jeaurat’s chart of the Pleiades, made in 1779, a vast nebulous mass is represented near the stars Atlas and Pleione. This has since been identified by Goldschmidt as part of a huge, ill-defined nebula, which he thought he could perceive enveloping the whole group of the Pleiades. many observers however, could never see nebulous masses, and were inclined to doubt their actual existence. Within the past few years astronomical photography, having made astonishing progress, has thrown light upon the mysterious subject. The sensitized plate of the camera, when applied at the focus of a properly constructed telescope, has proved more effective than the human retina, and has, so to speak, enabled us to see beyond the reach of human vision by means of the pictures it makes of objects which escape the eye. In November 1885, Paul and Prosper Henry, turned their great photographic telescope upon the Pleiades, and with it discovered a nebula apparently attached to the star Maia. The most powerful telescopes in the world had never revealed this to the eye. Author’s note: The reflection nebula around Merope was uncovered by Wilhelm Temple using a modest 4 inch achromatic refractor. Historical documents do indeed show that this nebulosity was notoriously difficult to discern visually, especially with large, observatory-class instrumets. One record shows that the celebrated double star observer, S.W. Burnham, failed to see any nebulosity around Merope using a much larger refractor than anything Temple had access to and so expressed doubt of its existence. It was spotted by E.E Barnard though. Such stories are not unique to the Merope Nebula, as similar anecdotes have been reported concerning the Rosette Nebula in Monoceros, which is much better seen in a small, rich-field telescope than a large one with a restricted field of view. The author is uncertain as to the precise photographic telescope used by the brothers Henry referenced by Serviss above, but it was probably a fore-runner to their 33cm and larger 62cm astrographs used by astronomers at Paris and Meudon Observatory, respectively, in the 1890s. For more information please see chapter 26 on the Great Meudon Refractor in the author’s book, Chronicling the Golden Age of Astronomy (Springer Nature 2018). The glory of Orion. Note Betelgeuse(red) at top left and Rigel(white) at bottom right. Image credit: Wiki Commons. To the naked eye, to the opera glass, and to the telescope, Orion is alike a mine of wonders. This great constellation embraces almost every variety of interesting phenomena that the heavens contain. Here we have the grandest of the nebulae, some of the largest and beatifully colored stars, star-streamers, star-clusters, nebulous stars, variable stars.I have already mentioned the positions of the principal stars in the imaginary figure of the great hunter….. Betelgeuse, it may be remarked is slightly variable. Sometimes it appears brighter than Rigel, and sometimes less brilliant. It is interesting to note that, according to Secchi’s division of the stars into types, based upon their spectra, Betelegeuse falls into the third order, which seems to represent a type of suns in which the process of cooling , and the formation of an absorptive evelope or shell, have gone on so far that we may reagrd them as approaching the point of extinction. Author’s note: Even at the end of the 19th century, it is clear that astronomers had already envisaged an evolutionary sequence of events that causes stars to change throughout their lives. Secchi’s primitive stellar classification sheme gave way to the more elaborate Hertzsprung-Russell scheme, where a robust physical theory underpinned this change, greatly aided by the genius of Sir Arthur Eddington, who’s seminal work established the physics of stellar interiors and who clearly demsonstrated how they change as a function of time. Betelgeuse is indeed at the end of its life and is fated to explode in a cataclysmic supernova event. It might have already happened, for we would have no knowledge of the event for 500 years, which is the time taken for its light to reach us. Mighty Betelgeuse is a mammaoth star, whose diameter exceeds that of the orbit of Mars. In Rigel we see a sun blazing with the fires of youth, splendid in the first glow of its solar energies, and holding the promise of the future yet before it. Rigel belongs to a new generation of the universe; Betelgeuse to the universe that is passing. Author’s note: In Serviss’ day, astronomers believed stars started out their lives shining in white or blue-white hues, but as they aged they cooled off into yellow and finally red suns. This is the reason why some old-school astronomers still refer to the whiter stellar varieties as ‘early’ and their ruddier counterparts to be ‘late.’ In reality though, stars vary greatly in their longevity. Small stars, like the exceeding abundant red dwarves, which comprise perhaps 80 per cent of all suns in the Creation, can maintain a stable existence for trillions of years. The largest, in contrast, are fated to self destruct in just millions. The lifetime of a star is dictated by its mass and scales as (Mo/M)^2.5, where M is the mass of the star and Mo is the mass of the Sun. It follows that while Betelgeuse, with an estimated mass of ~ 12Mo will have a lifetime of (1/12)^2.5 or just 0.2 per cent of the Sun’s lifetime (~10 Gyr). This fits well with its estimated age of ~ 10Myr. Turn your glass upon the three stars forming the Belt. You will not be likely to undertake to count all the twinkling lights that you will see, especially as many of them appear and disappear as you can turn your attention to different parts of the field. Author’s note: The ~4.5 degree field of view of the opera glass easily fits the three belt stars in the same portal and is a joy to behold on a dark, winter night. The glass reveals that all three stars appear white, reflecting perhaps their common origin from a larger, so-called OB Association. From left to right these stars are given majestic names; Alnitak, Alnilam and Mintaka. Arranged as a slanting line, they naturally create the illusion of being at the same distance but this is, once again, a pleasant fiction; Mintaka is both fainter and nearer than the other two belt stars, which are situated about three times further away. The belt stars actually form part a much grander arrangement of suns known collectively as Collinder 70. Held steadily, the opera glass will reveal a swarm of fainter stars, many of which are of the 6th and 7th degree of glory, in and around the three belt stars. When observed with a modern 10 x 50 binocular, Collinder 70 is a breathtaking sight! The reader is best advised to wait until the constellation culminates over the southern horizon to make the most at teasing the fainter members of Collinder 70 out of the murk, as they are more easily picked off with increasing altitude. Sirius, in fact, stands in a class by itself as the brightest star in the sky. Its light is white, with a shade of green, which requires close watching to be detected. When it is near the horizon, or when the atmopshere is very unsteady , Sirius flashes primatic colors like a great diamond. The question has been much discussed , as to whether Sirius was formerly a red starIt is described as red by several ancient authors, but it seems to be pretty well established that these descriptions are most of them due to a blunder made by Cicero in his translation of the astronomical poem of Aratus. It is not impossible, though it is highly improbable, that Sirius has chnaged color. Sirius does indeed corruscate wildly in the dense air near the horizon at my far northerly latitude. The colours of Sirius seen by the naked eye and through the opera glass reveal the complex interplay between brilliant star light and atmospheric refraction. The very idea that Sirius was once a red star seems altogether unlikely to me and Serviss’ pointing to Cicero’s “blunder”, as it were, seems entirely reasonable as the explanation as to why this myth has been perpetuated throughout the centuries. Author’s note: Although many observers more conveniently located further south rightly describe M41 to be a rather spectacular sight in larger binoculars or a small, rich field telescope, it’s very low altitude at 56 degrees north latitude detracts significantly from its visual punch. That’s regal advice for anyone in any time! Having selected your glass, the next thing is to find the stars. Of course, one could sweep over the heavens at random on a starry night and see many interesting things, but he would soon tire of such aimless occupation. The observer must know what he is looking at in order to derive any real pleasure or satisfaction from the sight. Serviss begins his overview of the spring sky with a rather bold assertion; haphazard scanning of the heavens with an opera glass is something observers will soon tire of. I respectfully disagree with Serviss in this matter, as I rather enjoy sweeping up starfields, moving randomly one way, and then another, ‘discovering’ new and interesting configurations of stars, unnoticed asterisms as it were, that I may happen to chance upon. What is more, I have come to view all of my binoculars as providing different sized portals on the night sky, with each one opening a unique window on the darkness of space. When it comes to stargazing, getting lost can be an exciting prospect! In the same way you will be able to find the constellations Cassiopeia, Cepheus, Draco, and Perseus. Don’t expect to accomplish all in an hour. You may have to devote two or three evenings to such observation, and make many trips indoors to consult the map (see page 8), before you have mastered the subject; but when you have done it you will feel amply repaid for your exertions, and you will have made yourself silent friends in the heavens that will beam kindly upon you, like old neighbors, on whatever side of the world you may wander. Remember that no two persons’ eyes are alike, and that even the eyes of the same observer occasionally require a change. In looking for a difficult object, I have sometimes suddenly brought the sought-for phenomenon into view by a slight turn of the focusing screw. Author’s note: I can certainly affirm what Serviss is saying here. The eye can vary somewhat in its degree of accommodation of an image and it has become his custom to keep his hand on the focusing wheel while viewing an object, tweaking it ever so slightly to get the optimal focus.Small chnages can indeed yield dividends, especially on fainter open clusters and nebulae. Of course, changes in altitude also require routine re-focusing. This entry was posted in Astronomical topics by Neil English. Bookmark the permalink. Looking forward to read the follow-up of this very interesting article. My interest is not platonic since I printed and spiral bound the book ”Astronomy with an Opera Glass”. And I own a 3.6x40mm Galilean binocular of Japanese make bearing the name of ”Hapo Lord”. Reenactment could be a very elevating experience. Hope you had a great summer. Thank you for the thumbs up on this blog. I’m very much looking forward to exploring the night sky with this very old school instrument but it should reveal some useful insights into how those late 19th century observers viewed the heavens. It looks like a great piece of classic literature which will be good to share with everyone. Maybe we can compare notes at some later stage!